A Comic of Earthly Proportion! I originally opened the Neon Neuron website as a flash-site, until I became aware of the limitations of a flash only website. 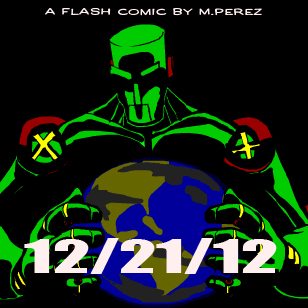 This was a comic I released for the the flash only. It's now hosted at my DeviantArt page. This is a silly story on why the world didn't end on 12/21/13 or any other dooms day, for that matter. Keeping Earth safe is no easy task, what with all the dangers floating around space and making trouble for everyone: Aliens, dopplegangers and asteroids. How is a Neuron to get any rest?